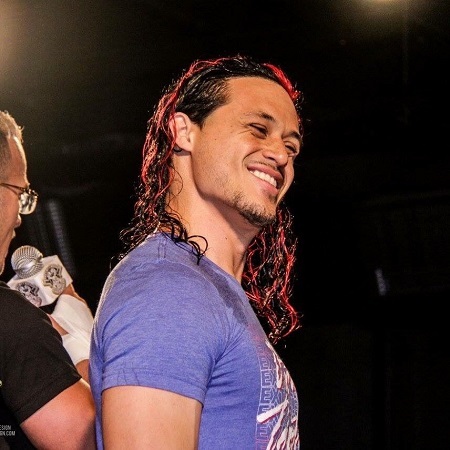 Aaron Solow; the handsome and lovable boyfriend of WWE superstar Bayley is also a wrestler by profession who performs on the Independent Circuit like WrestleCircus. Aaron is in a relationship with Bayley for many years and in 2016 he got engaged to his girlfriend. So, today let us discuss the adorable couple in today's section. The famous wrestler, Bayley is engaged to Aaron Solow. The couple is dating for many years and is now planning for their marriage. The couple first met while they were both pieces of training in California. They share a strong bond but Aaron feels so annoying when he is mostly known as a fiancé or boyfriend of Bayley. He also uploaded a video mentioning his disagreement but this does not mean that he does not love Bayley. He just wants to be known by the public for his work and dedication but not by his girlfriend. Though the lovebirds don't usually share images together on social media, we have found one of those on Instagram. We are still waiting for the pair announcing their wedding date but when will the day arrive? Before starting his career professionally, he took training in California. After the proper training, he started his career as a wrestler and performed with a variety of independent circuits. Solow performed with Laredo Wrestling Alliance and is the former member of Anarchy Championship Wrestling as well. Besides this, he performed in WrestleCircus where he performed against Ricky Star, his fellow wrestler. WrestleCircus has also launched a new show in 2017 at South. He is also engaged with independent promos including Shine Wrestling, NWA Championship, Big Time Wrestling, and many others. Slow rose to fame after joining WWE as an alternative in 2016. The WWE was selecting the wrestler from Cruiserweight Classic but he was not among them. As wrestling is the game where injuries can often happen. So, they kept some of the alternatives to recover those players and Aaron was one of them. From this, his journey started in the WWE, as he played in NXT Takeover: San Antonio. He loosed the game against Wolfgang. Moreover, he debuted in the Akira Tozawa's 205 Live but this time also he lost the game. Aaron Solow posing for a click. Born on 4th February 1987 in San Francisco, California. Took training in Crossfit and was trained by Tony Kozina and Davey Richards. Ecame a member of the ACW and the WWE. Was an alternate in Cruiserweight Classic. Appeared on 205 live with the ring name, Aaron Solo. Got engaged in 2016 with Bayley. For more updates follow our page!!!!!!!!!!! !